Although known in our community for trucks with pictures and themes on their side, we are better known in our industry as the company that “Makes it Happen”. 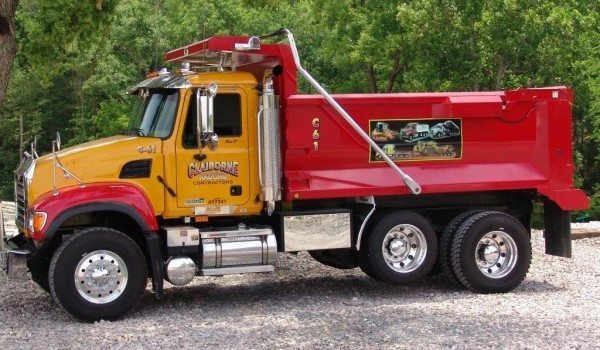 Starting with one single axle dump truck in 1997, Claiborne Hauling LLC has grown each year to where there are now over 175 trucks and pieces of equipment in the fleet today. All of our trucks are GPS equipped and designed to meet our stringent specifications based on work performance & readiness, toughness, and safety; all while being some of the best looking and cleanest trucks on the road. In 2012 we celebrated our 15th year in business by continuing with our business motto of “We Make It Happen”. Claiborne has become the premier hauling contractor in East Tennessee by maintaining a “SAY WHAT WE DO AND DO WHAT WE SAY” business model. Claiborne thrives on customer service. Our 15 year anniversary also saw the completion of our largest contract to date for Lata-Sharp Remediation, hauling off 164,000+ Tons of demo debris from the K-33 building @ the Y-12 Dept of Energy facility in Oak Ridge, TN. The project consisted of 14,700 loads traveling 353,800 miles in 16 months. Along the way Claiborne decided to add value to our hauling services by becoming a “ONE STOP SHOP”. We partnered with a quarry operation producing our own crushed stone as well as acquiring American Sand Company which produces a full line of sand products. We also hold a TN General Contractors License, Septic Installer Permits, HazMat endorsements, TN Hazardous Materials Transporter Permit, Dept of Energy MCEP Certification, and act as Mentor to a locally owned TDOT Woman Owned DBE. All-in-all, there is “NO JOB TOO BIG or TOO SMALL” and we are here to handle your needs. Just like when we started, HAULING is at the core of our business today. By the hour, by the load, or by the ton, we can haul anything from fill dirt, top soil, graded stone, lime, sand, decorative stone, mulch, demo debris, heavy equipment and specialized loads, to hazardous materials. “YOU CALL, WE HAUL”!